Descending branch of Stephen Snopek (1899 – 1958) is quite emotionally attached to this place. The main reason is that Stephen Snopek married daughter of ranger from Tarabovec – Augustin Priecinsky. Her name was Augustina Priecinska. Their firstborn son Stephen (1920 – 1992) wrote his remembrances and memories about Tarabovec (and about Cuklasovce) - only in slovak language. The history of Snopek family may be attached to this place even more, what will be confirmed if the interrelatedness of gender Snopek's mill in Tarabovec will be proved. This is mention in monograph of village Dubodiel, written by M. Ďurco and A. Mikula, published in 2005 (read the passage below). Blue sign indicates locality Tarabovec. 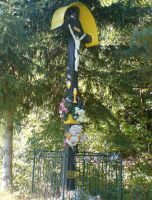 Although the lodge does not longer exist, as traces of the past there remained well (with a depth of minimum 20 m) and the cross, which in 1965, replaced the original cross. Ervin Snopek maintains the cross. . The cross in Tarabovec in the past and now. 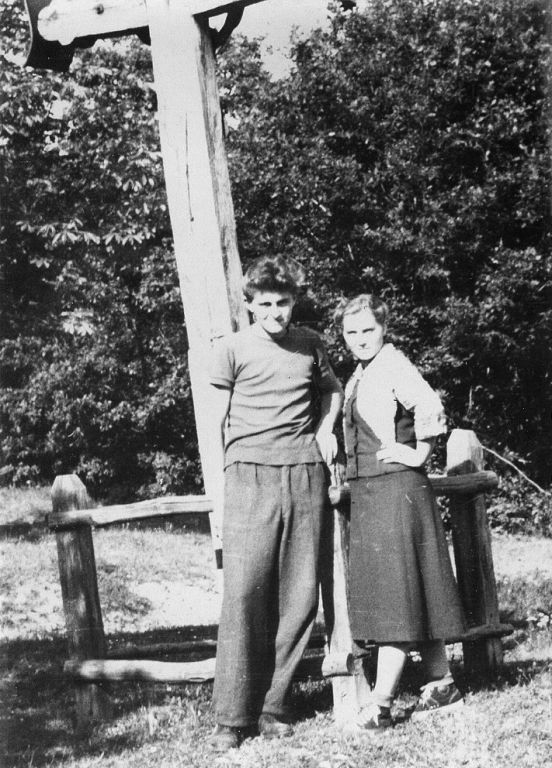 In the photo is Olga Snopkova (married Kucharikova) and Vaclav Snopek (click on the picture to open its original size). (click on the picture to open its original size). 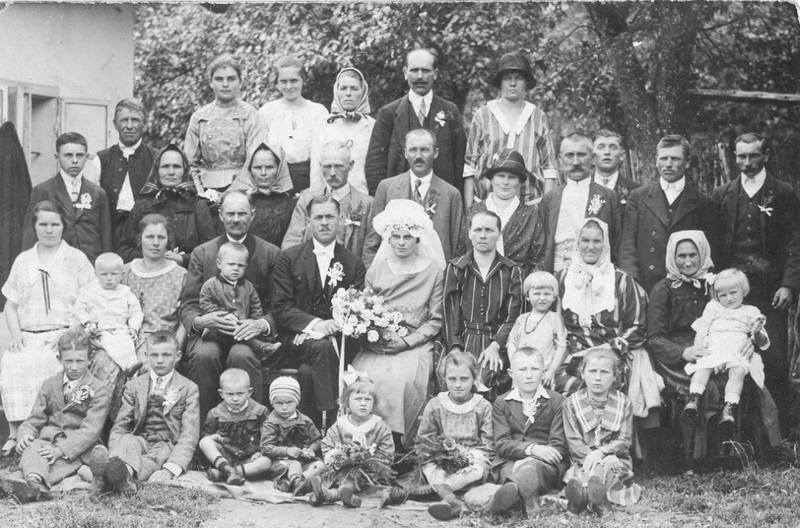 Photo in Tarabovec from the wedding of Anicka Priecinska and widower Peter Vavro (26.6.1925). Six years before the wedding Peter Vavro married Anicka´s sister Margita. On the photo, third from the left behind the children, sits Augustine Priecinsky, the ranger. On his lap sits little Kliment Snopek. Next to his knees sits little Stephen Snopek (the author of memories and remembrances of Tarabovec nad Cuklasovce). In the same row, next to the bride, is ranger Priecinsky ´s wife, Maria. In the row above, the first from the left,is Anton Priecinsky, who later moved to Zlatniky. Augistina Snopkova (dressed in white blouse) is in the top row the second from the left. In the row of seated children, the third from the left, is Maria (Mariska „Handlovska“) Priecinska and beside her sits Ferko Snopek – the brother of Stephen Snopek (1899 – 1958) who was at the time of wedding in Argentina . The settlement was delineated on the map from 1914, at the 320 metres above the sea level, on the interface of Dubodiel, Cimenna, Cuklasovce and Zlatniky. This settlement had dominant position. It was on the boarder between Dubodiel´s manor and Sucha Valley manor and a road link heading from Hlohovec to Trencin. Also from Tarabovec led the main roads to Dubodiel, Zlatniky, Cimenna and Cuklasovce. In the other direction to Stanoviste and then through the saddleback under Jakubova in Inovec to Beckov, Nove Mesto nad Vahom and to Selec. The settlement belonged to the Dubodiel´s manor with several farm buildings and buildings constructed at the culmination point. Panorama view on the Tarabovec from west. The settlement had problems with water shortages. 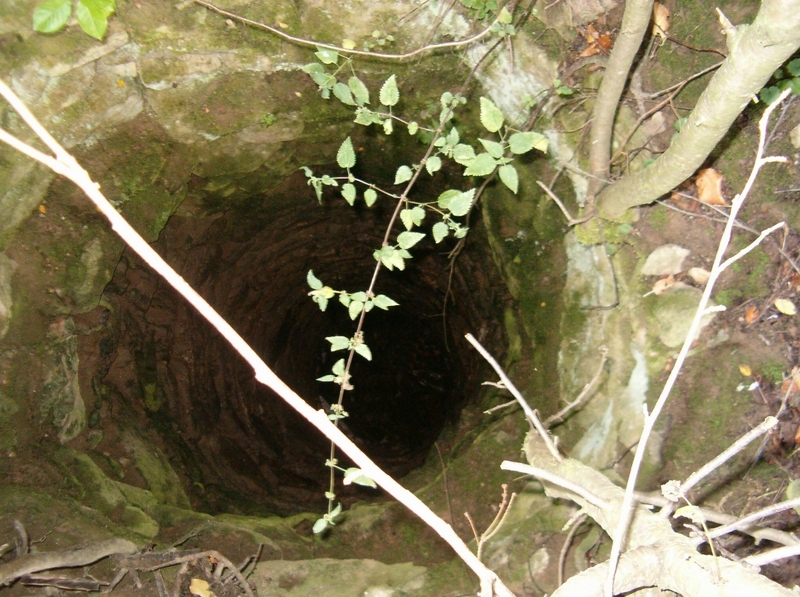 The well with depth of 26 metres and with a stone lining, iron chain and two buckets was not sufficient for the needs of settlers and the wayfarers. In the past centuries, was born a courageous deed, maybe a bet, to bring water from the Zvalivecke Mountains through the moat to Tarabovec. The moat was trenched in the contour line through the loess loam with a length of about 3 km. During summer, the water was sucked into the ground. In spring and winter, there was no problem with the water. In the settlement, they build a mill and a timber mill powered by millwheel and surface water. An artificial watercourse also should have solved the problem of water scarcity in the village Cimenna. 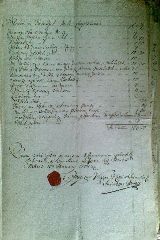 Existence of this mill provides an archival finding from 16.1.1774, when the authority of the throne Jozef Vagyon sworn in Trencin made an assessment of the mill at 165 golden coins and 30 denary. The assessment of the mill was probably made because the decision was issued before the Trencin and Nitra stool on the abolition of all settlements and villages in Inovec´s Mountains, because remnants of anti-Habsburg uprising of soldiers were wandering there and they started the ravine. The above measures have been destroyed all wooden buildings and houses. (Source: ŠA Bytča, Fond Illešházy Trenčín, Patrimónium Ladula II. - VIII, inv. č. 170, Spisy mestečka Bánovce (1376), 1644-1820, škat. 67). The mill rating was provided to appraisal to Doc. Ladislav Mlynka, Ethnologist from FF UK Bratislava, chairman of Slovak Molinological Society. In his comments, it was a relatively large mill, in-room layout Room-Entrance-hall-Mill race, with entrance through the Entrance-hall and millrace. In the yard was chamber with neat-house and a small barn. Mill had two water wheels, but only a one pair of a grinding stones. It is not clear to what purpose had the second water wheel. The figure for how many years the artificial watercourse played its role does not remained. The moat is evident even after several centuries, as well as depression after the millwheel. The last owner of the mill was Ileshazi; the mill manager was Snopek. 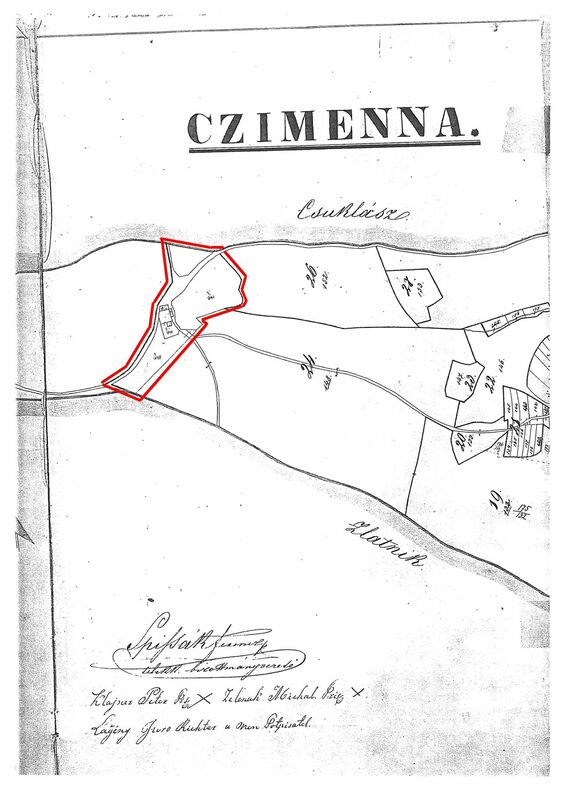 The settlement Tarabovec had its own butcher, possibly for Laziny, Zvalivec maybe even for Cimenna and Cuklasovce. More detailed information about the settlers is not remained. Almost the entire 19th century waggoners from Stolina mine conveyed through Tarabovec a limestone to the glassworks factory in Stara Huta. Also from this reason, the settlement was frequented. In the second half of the 19th century were shaped a new political - organizational districts, counties. They started to build a paved, gravel sand roads. In 1901, the railway Topolcany - Trencin – Trancianska Tepla was built. Travelling on foot, on horses and in carriages gradually disappeared. At the end of November 1944, the German army in prosecuting participants’ in partisans insurgency sweep Inovec’s forests and they burned down the settlement Tarabovec. From the settlement only remained the ruins that were destroyed by Czechoslovak National Forests when they created a mound on the south side. Later, when the log cabin started to disintegrates, the well was destroyed as well. In the settlement Tarabovec it can be found maintained cross , evident water moat, depression after millwheel and land belonging to the settlement. In addition, a fruit grove disappeared. Last rangers of the manor forest, who lived in Tarabovec in the 19th century and in the first half of the 20 century, were Lolosak, Priecinsky, Kovacik Stefan. Ranger Lolosik moved to Dubodiel. Ranger Priecinsky settled in Cuklasovce, later in Zlatniky. Zvalivecka Valley is located on the southwest side of Dubodiel. Zvalivec or whether Zvadlivec (dispute, quarrel, warring) - place of tragic event. Owners for the distribution of boundaries between the counties Dubodiel and Zlatniky could not agree, therefore the dispute resulted into the battle. According to an oral administration, the owner of Dubodielsky Forest killed in this another owner of a nearby manor. Mill in Tarabovec had from time immemorial Snopek’s adjective. Drawn from the source is not possible to determine what Snopek it was. Stoliny is away from Cuklasovce approximately 2 km towards Dubodiel. Below the soil surface are crystalline vitriol inwrought with golden veins. The very name suggests the mining of minerals. In the 19th century, it was produced sheet glass over here. 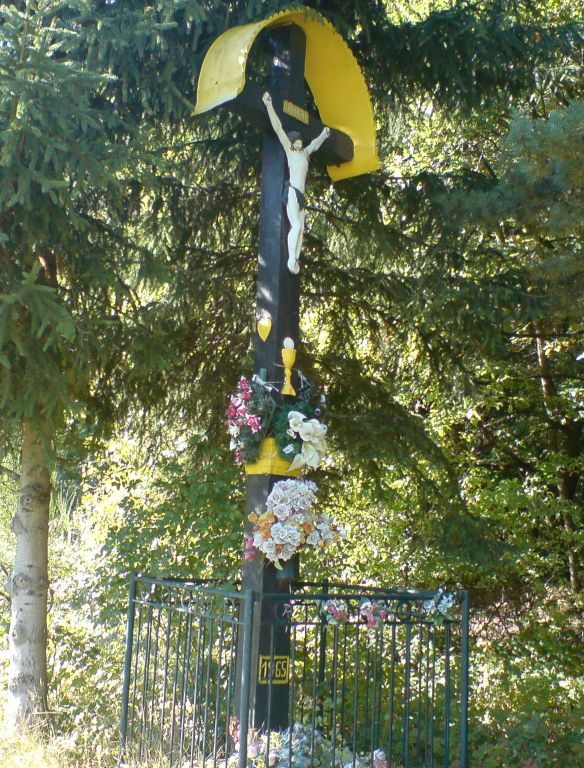 It is a wooden cross with the corpus of Jesus Christ, restored in 80 of the last century (see photo above). Unfortunately, there is not preserved the first name or any more details (the original comment - but we know that it was an Augustine Priecinsky). . In this case, it is a son of Augustine Priecinsky - Anton. .